Here is a LINK to my written materials from the Tort Talk Expo 2014 Civil Litigation/Auto Law/Bad Faith Update CLE in September. 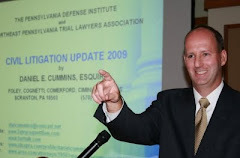 In addition to my written materials and articles, the packet also contains a section entitled "Koken/Bad Faith Update" by Attorney Scott Cooper of the Harrisburg, PA firm of Schmidt Kramer, and a section entitled "Depositions in Bad Faith Litigation" by Attorney Neil T. O'Donnell of the O'Donnell Law Offices in Kingston, PA. Note that the materials are in excess of 200 pages and, as such, may take sometime to download. These materials were also utilized as part of my Civil Litigation Update presented at the Lackawanna County Bench Bar Conference in October.